Government: Execution only for heinous crimes with "grave social consequences"
BEIJING, China (CNN) -- China, often criticized for its liberal use of the death penalty, will reduce the number of criminal executions it carries out, a top official said. 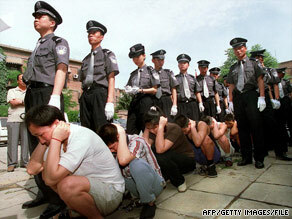 Chinese police guard a group of prisoners outside a Beijing court on May 25, 2001, before their sentencing. "As it is impossible for the country to abolish capital punishment under current realities and social security conditions, it is an important effort to strictly control the application of the penalty by judicial organs," Zhang Jun, vice president of the Supreme People's Court, said in an interview with Legal Daily, the state-run China Daily reported. "Judicial departments should use the least number of death sentences as possible, and death penalties should not be given to those having a reason for not being executed," Zhang said. Legislation will be enacted to restrict the number of death sentences imposed and the court will tighten restrictions on the use of capital punishment, according to Zhang. The sentence of "death penalty with reprieve" will be used more often in courts, Zhang said, which could be commuted to life in prison. The term could later be shortened to 20 years and possibly reduced further for good behavior. China will retain the death sentence, according to Zhang, adding that it should be applied to "an extremely small number" of serious offenders. Human rights groups estimate 1,700 to 5,000 people were executed in China last year for crimes such as spying, corruption and drug trafficking. The official number of executions is a state secret. The death penalty remains an iconic form of punishment in China, where executions are used as a public warning. Sentencing is broadcast on national television. Two years ago, however, the Supreme Court was given the authority to review death penalty cases and, last year, 10 percent of death sentences were overturned. Criminals who've expressed remorse or agreed to compensate victims' families have had their sentences reduced. The death penalty will now be reserved for those who commit heinous crimes with "grave social consequences," the government said. It's a step in the right direction, China analysts say. But they criticize the move as being too ambiguous and remain skeptical that it will lead to an actual reduction in executions. "This is a small incremental step, but a step in the right direction," said Victor Gao, a director of the China National Association of International Studies. "While other countries have abolished the death penalty because they think it is cruel and unusual punishment, China has decided it wants to keep the death penalty." Crimes with "grave social consequences" is a "broad, catch-all concept which can be interpreted flexibly," Gao said.